Live the romance of sailing amidst the wind and waves. Travel in comfort and style with the speed of a motorboat. 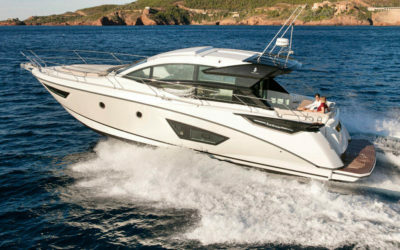 The Gran Turismo range boasts twin high-performance, high-technology engines, and all the very latest BENETEAU innovations. The interior style of Gran Turismo is renowned for its luminosity, comfort and large spaces, giving range real cruising strengths. When Benjamin Bénéteau started building fine sailing trawlers for fishermen at his small boatyard at Croix-de-Vie in 1884, he would have scarcely believed that the company that would bear his name would become a world leader in high-powered pleasure crafts. From the boatyard’s humble beginnings as originator of the first engine-equipped commercial fishing boat in 1909, Bénéteau went on to introduce some of the most iconic and most formidable powerboats in the world. 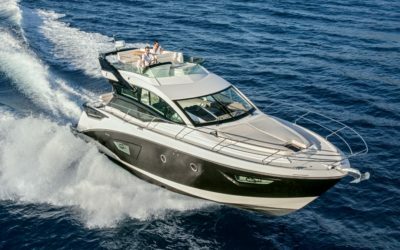 Among the latest in this long line of engine-powered luxury watercrafts are the boats belonging to Bénéteau’s Gran Turismo line. If there were a nautical analogue for the supercar, the Gran Turismo powerboats would surely fit the bill. All boats in the line are defined by their high-tech features as well as their incomparable luxury. These boats are not for those who like lazy weekends along the coast, though the boats themselves will happily comply. The Gran Turismo line is built for raw power and refined luxury, and is meant for those who want the absolute best in life. The series is well known in the yachting community for its luxurious features, including premium materials and furnishings, in contrast to the rather spartan accommodations of many other sports cruisers. The interior spaces are perfect on all of the models for entertaining family and friends, and even for hosting small parties on a day trip. 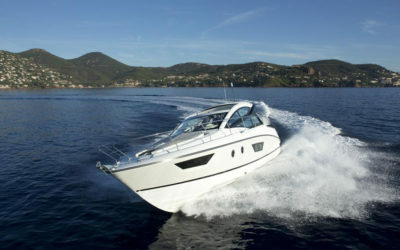 Philippine boating enthusiasts, in particular, will love the Gran Turismo line’s speed and handling. The capabilities of the Gran Turismo boats will allow you and your party unparalleled access to different beaches, islands, and other destinations, all in complete luxury. Gran Turismo powerboats and other boats by Bénéteau are available in the Philippines through Europa Yachts, the leading distributor of sailing yachts, powerboats, and other luxury vessels in the country. The thing that will immediately strike a seasoned sports cruiser enthusiast about the Gran Turismo line is the boats’ unconventional layout, at least relative to other sports cruisers. Bénéteau’s designers realized that the conventional sports cruiser layout was becoming predictable—an elevated cockpit with a C or U-shaped dining space and bar at the back, a saloon below with the head and galley below, and so on. The Gran Turismo line’s interiors are consciously designed to break the mold without anyone getting unfamiliar. A refreshing degree of logical asymmetry is evident throughout each model’s layout. Clever and stylish arrangements below decks have allowed designers to maximize the available space while still allowing the overall layout to be quite familiar. Lacquered finishes and walnut wood furnishings are just some of the premium features evident throughout the line, giving the whole experience of owning and being in a Gran Turismo boat undoubtedly an upscale experience. This is quite notable even when such experiences are not always available on sports cruisers. And if there were any doubts that these boats are true performance sports cruisers, the selection of engines available for each of the models will surely put them to rest. 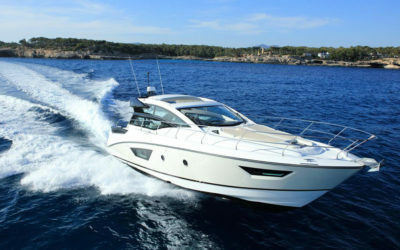 Bénéteau Gran Turismo Powerboats may be ordered through Europa Yachts in the Philippines. Available models include the Gran Turismo 50 Sportfly, Gran Turismo 50, Gran Turismo 46, and the Gran Turismo 40. All Bénéteau powerboats are built in one of Bénéteau's state-of-the-art boatyards in France. Call Europa Yachts at (+632) 553 2027 or (+63) 917 657 0045 or email at info@europayachts.net to learn about the Gran Turismo line.